Convenient Afternoon and Evening Hours 4-7pm! Dr. Titus Howell and our team would love to be your dental health partners. Working together, we can improve your oral health, leading to a healthier body and mind. We’ll also improve your smile, increasing your self-esteem and confidence in every situation. Ours is a family-friendly dental practice, where our priority is you. Your dental needs are unique; you deserve a custom treatment plan that’s tailored to your specific situation. Dr. Howell will ask about your treatment goals and concerns. He will consider those, along with your clinical needs, when developing your treatment approach. Our office emphasizes preventive care, to stop dental disease from starting. When issues do arise, Dr. Howell uses conservative treatments, which are comfortable, efficient, effective, and affordable. We provide dental exams, cleanings, and fillings to patients 10 years and up. Additionally, we offer digital X-rays and nitrous oxide for our nervous patients, and cosmetic dentistry, including Opalescence® teeth whitening. Our Rochester, NY dental office welcomes patients from throughout the region. Please call to learn more about the gentle, patient-centered care we offer and schedule a visit. 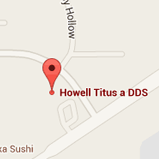 Dr. Howell and our team can’t wait to welcome you to our office. It would be our honor to help you develop optimal oral health and a wonderfully healthy smile. Call, today!